Start off your visit on the 1st (Sun): get engrossed in the history at Museo Larco, explore the ancient world of Huaca Pucllana, then don't miss a visit to Miraflores, and finally ponder the design of Plaza de Armas (Plaza Mayor). Here are some ideas for day two: wander the streets of Barranco, get a taste of the local shopping with Shopping Center Larcomar (Centro Comercial Larcomar), then get outside with Outdoor Activities, then pause for some serene contemplation at Iglesia y Convento de San Francisco, and finally take a stroll through Centro Historico de Lima. For maps, reviews, more things to do, and more tourist information, use the Lima online journey planner . Salvador, Brazil to Lima is an approximately 12-hour flight. You can also drive; or take a bus. The time zone difference when traveling from Salvador to Lima is minus 2 hours. Expect a bit cooler temperatures when traveling from Salvador in September; daily highs in Lima reach 22°C and lows reach 18°C. Wrap up your sightseeing by early afternoon on the 3rd (Tue) to allow enough time to travel to Punta del Este. With plenty of modern casinos, well-developed beaches, chic restaurants, and upscale hotels, Punta del Este vacations draw visitors from Argentina, Brazil, and beyond. Start off your visit on the 4th (Wed): examine the collection at Museo del Mar, tour the pleasant surroundings at Playa Brava, then pause for some serene contemplation at Iglesia Candelaria, and finally enjoy the sea views from Faro de Punta del Este. Get ready for a full day of sightseeing on the next day: explore the world behind art at Museo - Taller de Casapueblo, then stroll through Playa Mansa, then try your luck at Conrad Casino, and finally try to win big at Enjoy Punta Del Este Resort E Casino. 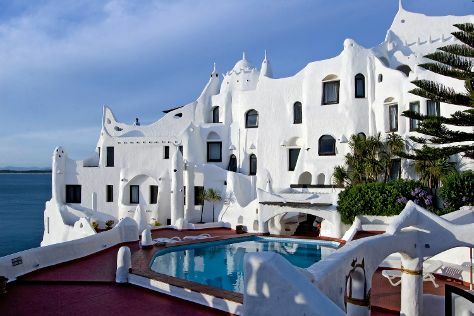 For maps, more things to do, where to stay, and tourist information, read Punta del Este trip planner . Getting from Lima to Punta del Este by combination of flight and bus takes about 10 hours. Other options: fly; or drive. You'll lose 2 hours traveling from Lima to Punta del Este due to the time zone difference. Prepare for slightly colder weather when traveling from Lima in September: high temperatures in Punta del Este hover around 19°C and lows are around 13°C. Finish your sightseeing early on the 6th (Fri) so you can travel to Bogota. Kick off your visit on the 6th (Fri): see the interesting displays at Gold Museum (Museo del Oro), then browse the exhibits of DIBS by Culture Shock Colombia, and then stroll through Mount Monserrate. Here are some ideas for day two: take in the architecture and atmosphere at Catedral de Sal and then browse the different shops at Centro Comercial Cento Chia. Plan a Bogota trip in moments using our itinerary builder. Getting from Punta del Este to Bogota by combination of bus and flight takes about 9 hours. Other options: fly; or drive. You'll gain 2 hours traveling from Punta del Este to Bogota due to the time zone difference. While traveling from Punta del Este, expect somewhat warmer days and a bit cooler nights in Bogota, ranging from highs of 22°C to lows of 9°C. Cap off your sightseeing on the 7th (Sat) early enough to travel to Salvador. On the 8th (Sun), pause for some serene contemplation at Igreja de Nosso Senhor do Bonfim, then hunt for treasures at Mercado Modelo, then take a stroll through Pelourinho, and finally admire the landmark architecture of Church of Our Lady of the Rosary of the Black People. Get ready for a full day of sightseeing on the next day: see the interesting displays at Santo Antonio da Barra Fort and Nautic Museum of Bahia, kick back and relax at Praia Farol da Barra, then see the interesting displays at MAM Museu de Arte Moderna, then take in the spiritual surroundings of Sao Francisco Church and Convent, and finally pause for some serene contemplation at Igreja da Ordem Terceira de Sao Francisco. Plan my Salvador trip by asking Inpirock to come up with tips and suggestions. Fly from Bogota to Salvador in 9.5 hours. Due to the time zone difference, you'll lose 2 hours traveling from Bogota to Salvador. While traveling from Bogota, expect a bit warmer days and much hotter nights in Salvador, ranging from highs of 32°C to lows of 26°C. Wrap up your sightseeing on the 9th (Mon) to allow time to travel back home.